The 63rd edition of boating exposition at Fairplex in Pomona will also feature sportfishing boats, personal watercraft and marine accessories. 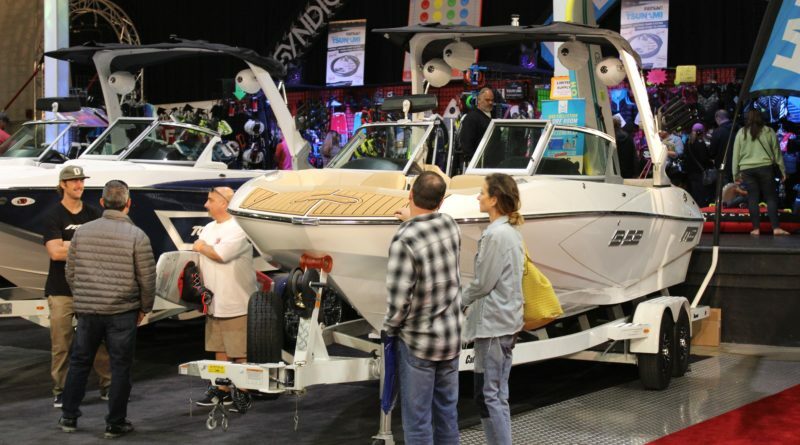 POMONA—The 2019 Los Angeles Boat Show, now in its 63rd year, returns to the L.A. County Fairplex in Pomona for the second time as the boating exhibition kicks off on Jan. 10. The show, which arrived at the Fairplex for the first time in 2018, will run through Jan. 13. The Los Angeles Boat Show features a variety of activities and entertainment to complement the large display of a range of boats. More than 250 new boats will be on display during the four-day boat show. Included in the addition to the large boat selection is the return of the high-performance boat manufacturers. This year’s show will see the largest gathering of high-performance boats under one roof in many years. “There will be pre-season discounts and incentives at the show,” said Los Angeles Boat Show CEO Duncan McIntosh. “Buyers are encouraged to take stock now, before the summer boating season begins and there is a backlog of orders. We are fortunate that California calls many of the top boating manufacturers home. “Centurion in Central California to Shockwave Boats in Corona, are just two of the boat builders who will be at the Los Angeles Boat Show,” McIntosh continued. The High-Performance Hall (Building 5) is where you’ll find the newest designs, latest technology, custom graphics and horsepower/propulsion packages. Attendees will also have the opportunity to climb inside a multi-million-dollar Lake Havasu racer. Also featured at the Los Angeles Boat Show will be cruiser and bay boats, speed and performance boats for wakeboarding and water skiing, pontoon boats, Jet skis and Sea Doos, and accessories (tow lines, wakeboards, fish finders, depth sounders, outboards and entertainment systems). State representatives will be on hand to discuss the new California Boater Card requirement. All motorized boat operators 25 and younger, as of Jan. 1, must complete a boating safety course and possess a boater card. A new age group will be added to the requirement each year between now and 2025, when all boaters must complete the educational component and carry a card with them when operating a boat. Free drawings will be held each hour. Everyone who purchases a ticket will be given a special drawing ticket. Bring this ticket to the hourly drawing booth in Building 7. Each drawing winner can pick from a pool of prizes available at the booth, such as outdoor equipment, boating accessories, fishing items, coolers, gift certificates and more. The drawing ticket is valid all day (or until it’s selected as the winner). New 2018 and 2019 models will be on hand from builders and manufacturers from around the country such as MasterCraft, Robalo, Centurion, Avalon, SeaDoo, Shockwave, Chaparral, Crownline, Tige, Hallett, Malibu, Premier Pontoons, Bennington, Bentley Pontoons, Tracker, Larson, Crest, Defiance, Ranger, Scout, Yamaha, Regal, SeaRay, Colbalt, Bayliner, Hurricane, Quest, Axis and many more. Dining at the Fairplex is available at various concessions and two restaurants: McKinley’s Grille and Finish Line Sports Grill. Nearby restaurants include Pomona Valley Mining Co., Coco Palm Restaurant, Donahoo’s Golden Chicken, Sanamluang Café, Guasalmex Restaurant and The Brick Market and Deli. The Los Angeles Boat Show kicks off Jan. 10 at the Fairplex, located at 1101 W. McKinley Ave., Pomona, California 91768. Show hours are noon-8 p.m. Jan. 10; 10 a.m.-8 p.m. Jan 11-12; and, 10 a.m. to 6 p.m. Jan. 13. Admission is $15 for adults and free for children 12 and younger. Active military, EMTs, police and fire personnel will be admitted at a $5 discount, with I.D. For more information on the Los Angeles Boat Show call 949-757-5959 or visit losangelesboatshow.com. The Duncan McIntosh Co. Inc. is publisher of Sea Magazine, Boating World and The Log Newspaper, FishRap and Editor & Publisher, and produces the Los Angeles Boat Show (Jan. 18-21, 2018), the Fred Hall Shows, Los Angeles Boat Show, Newport Boat Show and San Diego International Boat Show, produces the LA Harbor Boat Show. Event dates include: Los Angeles Boat Show at Fairplex, Pomona Jan. 10-13, 2019; Fred Hall Show in Long Beach, March 6-10, 2019; Bakersfield, March 15-17, 2019; San Diego, March 28-31, 2019; Newport Boat Show at Lido Marina Village, Newport Beach, April 25-28, 2019; San Diego International Boat Show, June 6-9, 2019.